Rajbiraj (Saptari) - People of Saptari's the rural and urban areas affected by floods from various rivers and streams triggered by the incessant rains since the past six days have started falling sick as various health-related problems like diarrhoea, typhoid, fever, cough, respiratory complication and itching have spread in the settlements. Rajbiraj, Hanumannagar, Shambhunath Municipality, Tilathi Koiladi Rural Municipality, Barsaine, Sakarapur, Bodebarsaine, Rupani, Kanchanrup Municipality, Joginiya, Bhardaha, Kirpura and Daluwa Belhi are among those areas hit by monsoon floods. Sakarpura-based teacher Bipin Jha complained that sick people had been deprived of medical care in the absence of health professionals in the local healthcare facilities and shortage of medicines. People of the affected areas in South and West Saptari have climbed up to the roof of cemented buildings and moved to relatively safe areas in open. Doctors at the Rajbiraj-based Gajendra Narayan Singh Sagarmatha Zonal Hospital have told that mainly women, children and aged people of the disasters-hit areas have taken ill. There is a noticeable flow of flood victims in these days in the hospital. Chief of the District Public Health Office, Nagendra Chaudhary, could not be contacted for his comment over the issue. But, office employees report that in charges of the respective health posts have been directed not to leave working stations in these hours and do all possible to render medical care to the people affected by disasters. Floods have densely damaged rural roads, making the people's movement to and from the district headquarters Rajbiraj very difficult. That's why sick people are finding it hard to visit the Zonal Hospital and other medical facilities in the district headquarters for treatment. Floods from the district-based Mohuli, Khando, Jita, Bigul Triyuwa, Khadak rivers and the Saptakoshi River due to the continuous rains have inundated over 3,000 houses in the district. Police Superintendent Mukesh Singh said rescue and relief distribution is on for those families who have been affected and displaced by inundation. 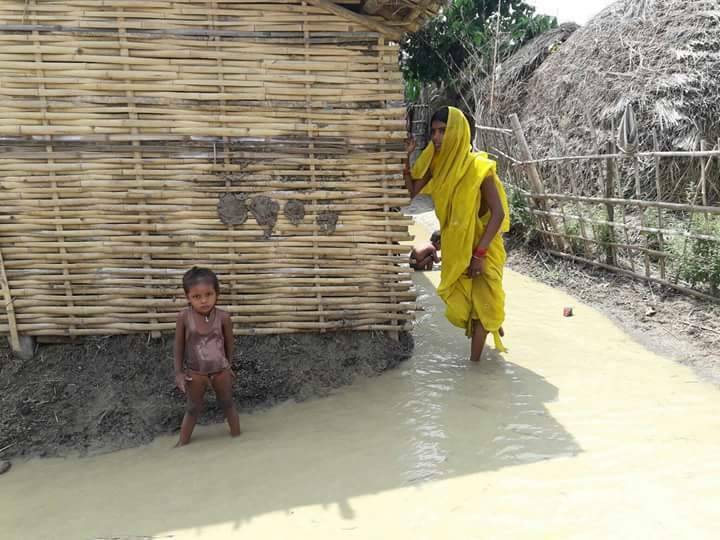 One person has gone missing in the flood so far in Saptari district while 75 per cent of the households have been hit by the flooding. The flood has swept away the irrigation canal at Malesth, Rajbiraj Municipality Ward No. 9. Similarly, transportation has become difficult as the flood has eroded the road at a place called Panchkilo among the Rajbiraj-Rupani road section. Most of the roads in the rural areas have been damaged due to the flood and erosion. An irrigation canal at Pampakinal at Rajbiraj-1 has caved in, causing a massive damage to the irrigation system in the area, according to Prasun Mishra, Chief of the Chandranahar Irrigation Division Office. The western branch of the irrigation canal at Bhardaha, Hanumannagar Kankalani Municipality-1 in Saptari has also broken due to the flooding. Meanwhile, the flood displaced people in the district have no food due to the inundation of their houses and food grains by the flood, Shyam Sundar Khadka, a local of Bhardaha said. He added that up to four feet of water has accumulated in the settlement and they have been staying on the dyke of the irrigation system. The District Administration Office, Saptari has stated that relief materials as foodstuff and goods have been distributed to the flood affected people at Deuri Bharuwa, Rampura and Malhani among other places in the district. Chief District Officer Krishna Bahadur Katuwal said the Nepal Police, the Nepalese Army and various organizations based in the district have been mobilized for rescue and relief operation in the district. Telecommunications services as DCL Net, mobile and telephone lines distributed by the Nepal Telecom has become non-functional since the last three days. The journalists are facing problem dispatching news due to this. Similarly, power supply to some parts of Rajbiraj, the district headquarters as well as the rural areas in the district has been disrupted. Minister for Population and Environment Mithila Chaudhary and Minister for Culture, Tourism and Civil Aviation, Jitendra Narayan Dev have arrived here to take stock of the situation in the district in the aftermath of the flooding, inundation and erosion.